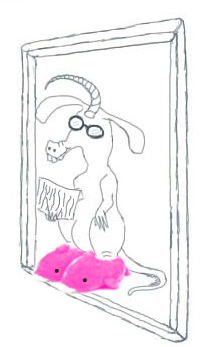 Nardvark and his alter-ego, the Nerdvark, don't always agree. Living on the edge, Nardvark likes to try new combinations in his sandwiches and pizzas. Nerdvark is of the opinion that certain condiments do not mix. Nardvark also has a problem with disagreements in his writing. Subject-verb agreement means that when you conjugate a verb (i.e. he runs, she runs, we run, they run...) you have to notice whether your subject is singular or plural. Everyone think I have an absolutely spectacular horn. Everyone thinks I have an utterly ridiculous horn. Nerdvark and his imaginary friend doesn't like peanut butter on hamburgers, even though it's delicious. Nerdvark and his mysterious friend don't like peanut butter on hamburgers, because it is revolting. Nerdvark or Nardvark feed their pet toucan every day. Seems like with the both of them in there, it ought to be a plural subject, right? But with "or" between them, we are actually only referring to one of them, so it's a singular subject. Nerdvark or Nardvark thinks about feeding their pet toucan every day, but only Nerdvark actually bothers to do it. Nerdvark, who has ugly furry feet, wear silly slippers shaped like fuzzy dolphins. Nerdvark, who has luxuriously furry feet, wears adorable slippers shaped like fuzzy dolphins. If you think you, like Nardvark, may have a problem with your subject-verb agreement, you can find more guidelines on The Nerdvark's favourite website, the Purdue Online Writing Lab. If you enjoy my blog and find it helpful, please support me by checking out my website: www.kiborrowman.net. Thanks!